Time to head home. I didn’t get to see many sites but actually had a pretty great time in D.C. for the work I was doing. I like to think I got to see more than the touristy stuff most people go to our nation’s capitol for. My co-worker had something come up and needed to get home quicker than an 11 car ride would get him there so he ended up flying. I dropped him off at Reagan National around 8:30 AM then headed on the George Washington Parkway out of town. The next ten hours or so would just be me, some Marc Maron podcasts and long stretches of highway on the three Turnpike’s between me and Michigan. I noticed on our way in to DC on Wednesday night we passes some Waffle Houses. I was looking for those on the way back hoping I was taking the same route. Near Frederick, Maryland I finally saw one of those little yellow signs on the big blue signs right off the highway. The first one I came to was right off I-270 and MD-80 in the census designated community of Ubrana, Maryland. The newer looking building sits right next to a 7-11 Gas Station less than a half a mile from the freeway interchange. I was pumped and chided my co-worker that he may have gotten to fly home but I got to stop at Waffle House. 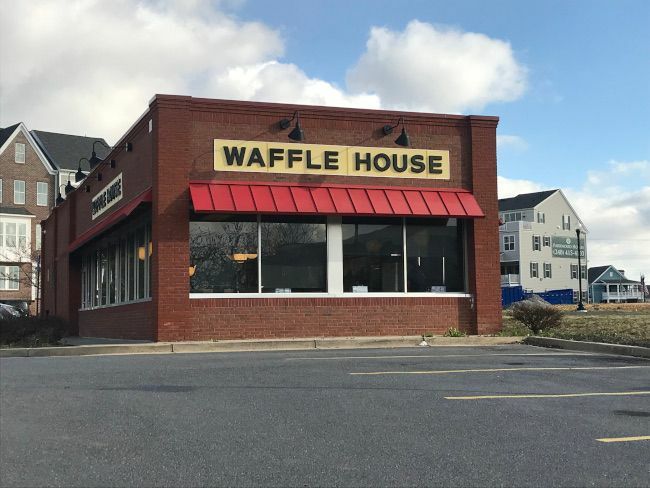 The small, rectangular building looks newer than the Waffle Houses I’ve stopped at in the past but it’s the same tight rectangular layout with black and white checkered floors, red leather seat cushions, and that classic diner lunch counter for diners traveling solo. Because I was by myself, I passed on the larger seating options. 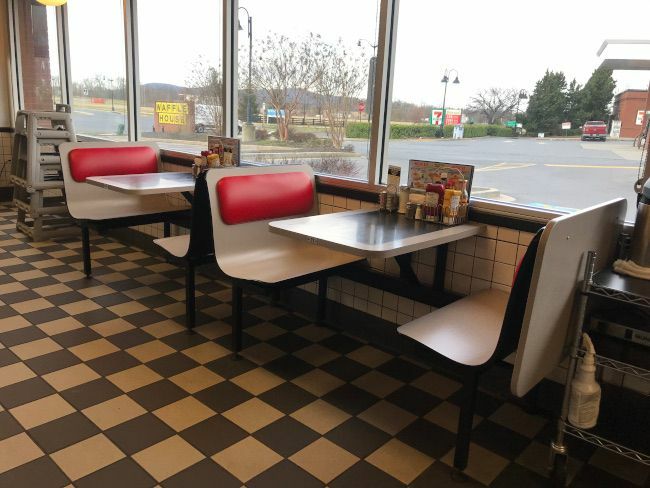 There are booths that line the outside walls as well as some tables. No one was sitting at the counter when I walked in so I took a seat and grabbed a menu off the counter top. 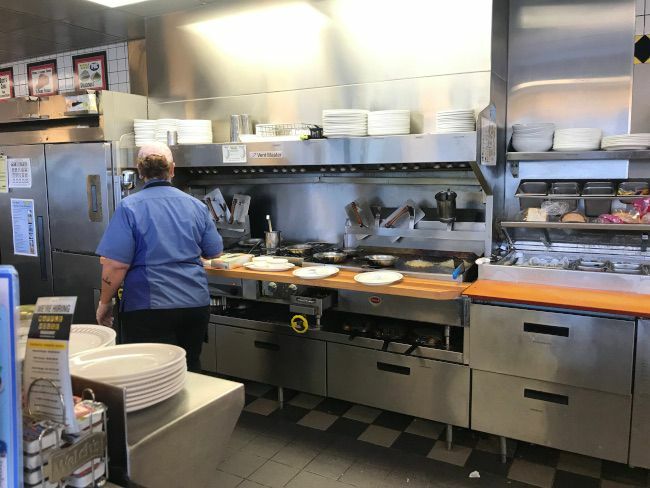 Waffle House doesn’t make it’s whole menu readily available for some reason. The one they keep on the counter is the “favorites’ but there’s a bigger menu if you ask. I knew what I wanted before sitting down so I didn’t ask. I picked the same thing I always do at breakfast…the Steak and Eggs. There’s an option for a T-Bone Steak and Eggs, but the sirloin is just fine for me. 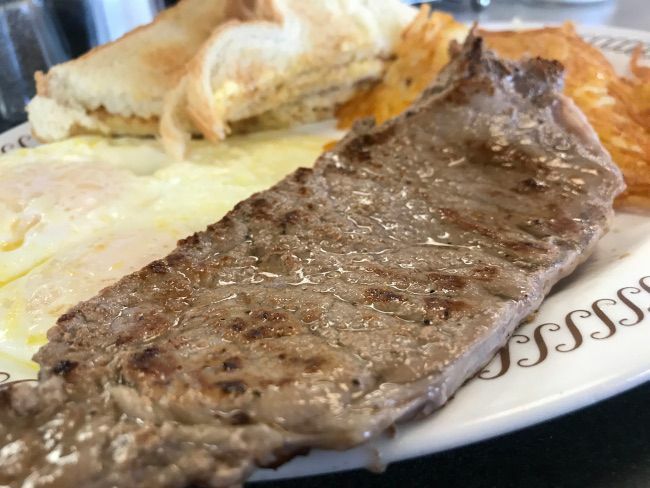 The meal comes with that steak, two eggs, hash browns, and toast. 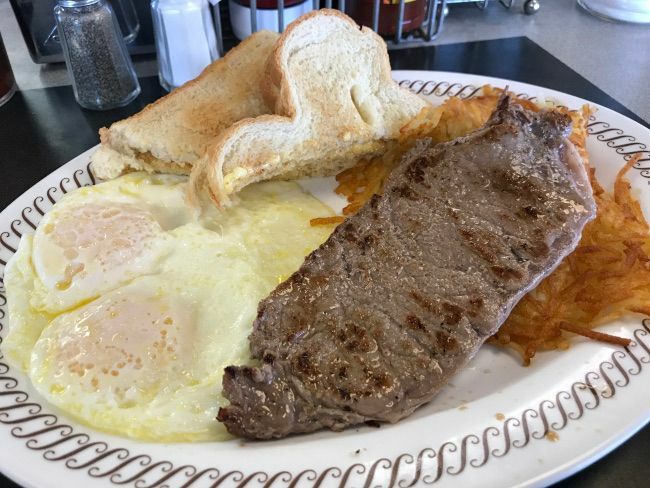 People like to give me crap for ordering steak at a Waffle House but here’s the thing…it’s cooked on such a well-seasoned, greasy flat top that imparts a salty, crusty flavor I just can’t describe. The steak is a cheap cut of meat. I asked for it cooked medium rare but that’s almost impossible with this kind of steak. It came out almost well done and that was fine. It had that carmelization on the edges and a deliciously salty crust. It was just fine the way it was. 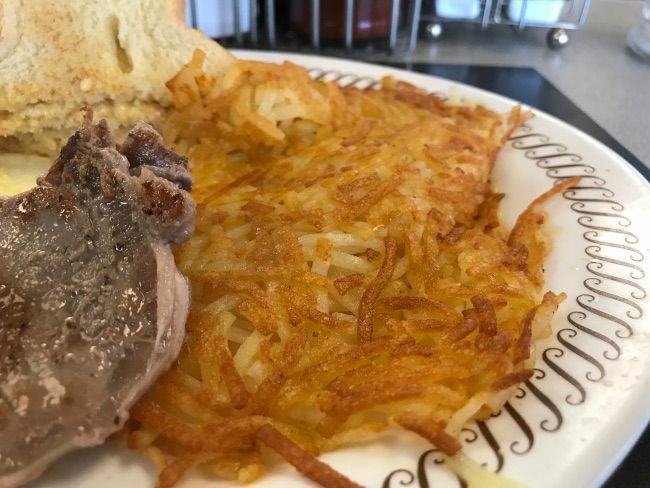 The hash browns at Waffle House are amazing. They’re little tubes of potatoes instead of the more common flat grated hash browns. There are several additions to get on the hash browns but the waitress walked away from me as I was looking them over. I just kept my mouth shut because even just served straight up, these are some of the best hash browns ever. They’re crispy on both sides and cooked all the way through…the way hash browns should be. My bill for breakfast was a little over $12 before tip. It such a quick, delicious breakfast. I mean, I get it. 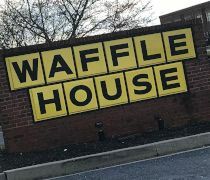 To people who have access to Waffle House all the time, it’s just another chain. I only get it when I travel to the south which turns out to be about once a year. 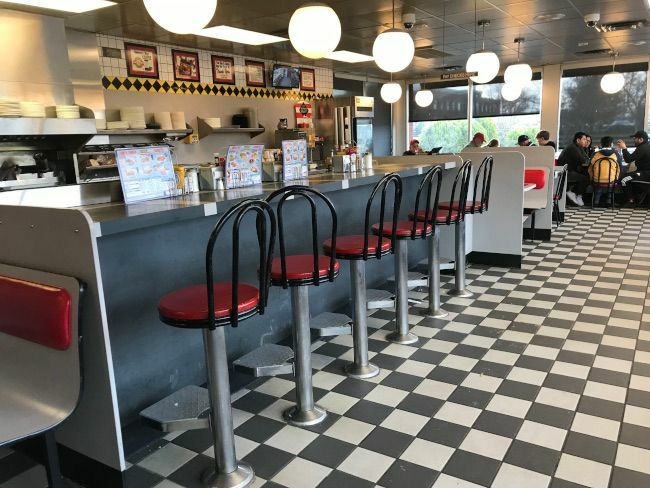 Waffle House is just so different from the other breakfast chains. Everything from the restaurant layout to the food. It’s simple food that you’re not going to pay a lot for…but it’s going to be incredibly satisfying and a quick meal to get you back on your way.